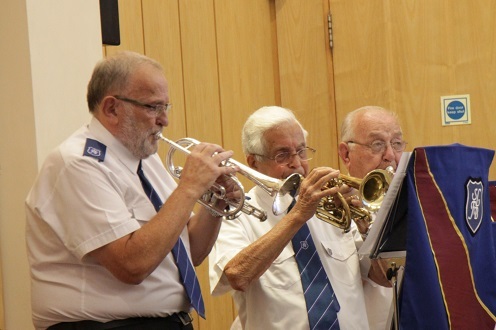 The South London Fellowship Band celebrated its 20th Anniversary at Bromley Temple in front of an audience made up of former band members and friends made over the past 20 years. 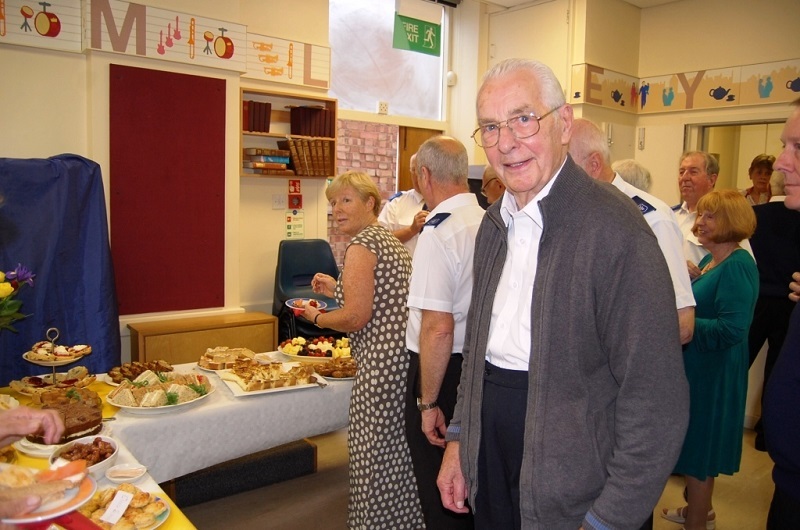 The Saturday evening programme was led by the band’s founder, Major George Whittingham, and consisted of items which have been popular with the band and audiences over the history of the band. The programme gave a full representation of the band’s musical ability with the range of music played. These items included the march ‘Pakefield’; ‘Triumph of Peace’, an Army classic that the band has played many times and still comes up afresh (Darrell Scholes musicianly playing of the cornet solo ‘Peace in our time O Lord’ in this number was a delight to hear); and ‘Crown of Gold’. Before the programme all current band members had received a special lapel badge celebrating this event. During the evening all former members present also received a badge; a number of whom mentioned how very proud and privileged they were to receive this memento of a special occasion. The band’s depth of soloist talent was evidenced in the solos featured during the evening. 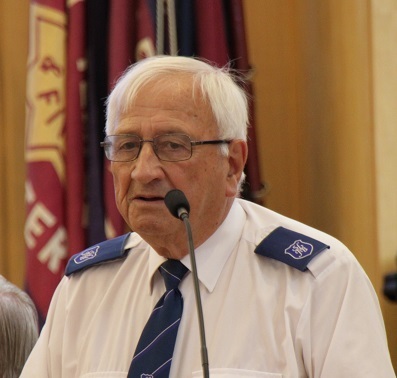 Alan Moyes showed that age does not place a barrier on the tone as he played the cornet solo ‘Clear Skies’. Adrian Horwood’s euphonium playing is legendary and he didn’t let us down, giving a stunning performance of ‘The Better World’, one word – Brilliant. The cornet trio featured three of the bands’ founder members (Andy Stewart, Eric Rapp and Brian Hillyer) who were introduced as having over 200 years of playing experience between them. Who would have thought it as (once they had put their Zimmer Frames away) they romped through the aptly named trio ‘The Veterans’. The full trombone section played an arrangement of ‘Over the Rainbow’ and Les Swift sang ‘A Different Man’ (his adorable voice never seems to fade and sends blessings each time his vocal chords ring). 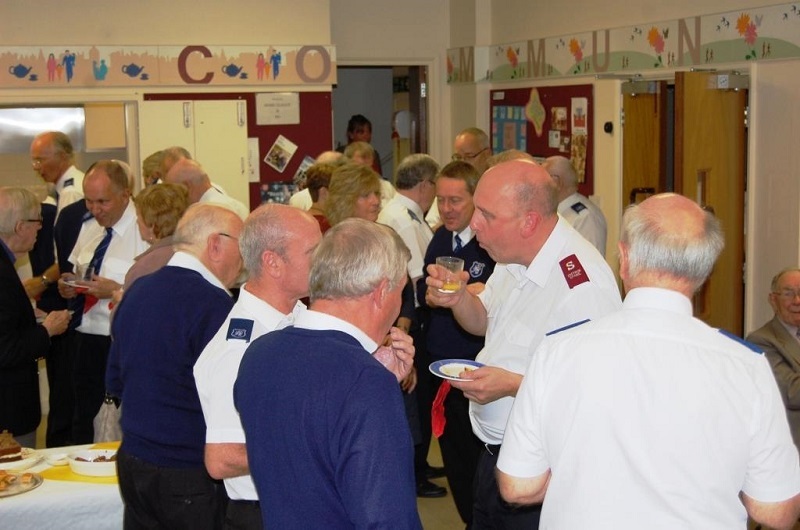 The evening had commenced with the march ‘Roll Call’ during which there was a powerpoint presentation listing the names of all present and former members of the band. Later in the evening (following a bible message by Roger Gadsden about Fellowship – of which there is so much in the band) the band presented the music ‘I’ll Walk with God’ a good choice as a backing to a further powerpoint presentation which listed those from the band who had been “Promoted to Glory”. A very moving moment. A regular feature of the band’s programmes is its singing. Once again this was a highlight for many. After the opening march the band sang ‘The Lord’s Prayer’ which made a tremendous impact on those present and set the standard for the rest of the evening. The bands vocal chords were in fine strength with the singing of ‘Sound the Battle Cry’, and the singing of ‘Rock of Ages’ (with Les Swift singing one of the verses as a solo giving that extra special touch) really exercised the band’s lungs. 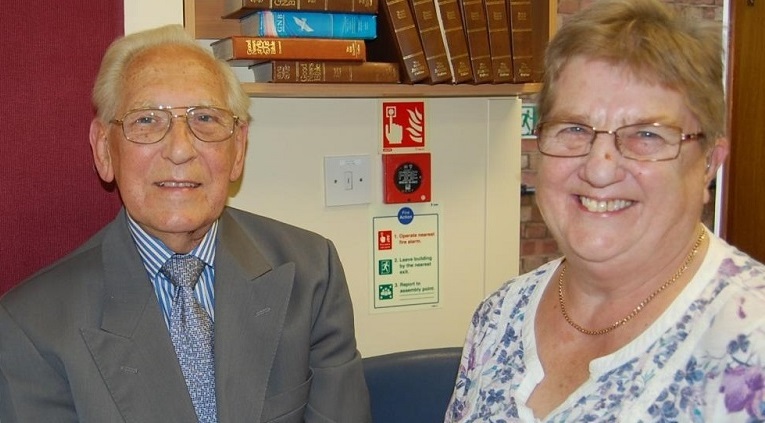 Roy Horscroft, former Bass Trombone Player, spoke about his 18 years in the band. At one time he arranged for the band to play to the Archbishop of Southwark by special request from the man himself. Towards the end of the evening, after a feast of good music, George Whittingham gave some well chosen words concerning the beginning of the band and its well trodden path during the intervening years, before handing the baton over to the band’s new leader, Darrell Scholes, who then led the band in its final item of the evening, the well known composition ‘My Comfort and Strength’. 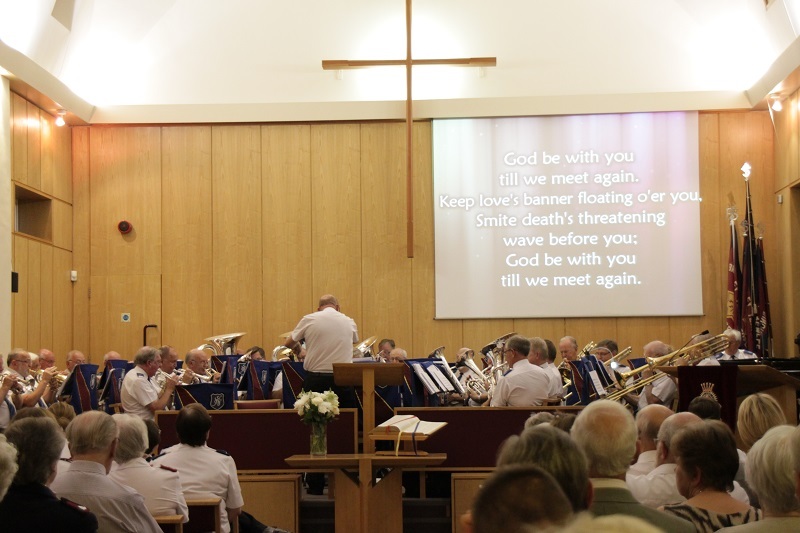 On the Sunday the band led the morning meeting during which they played ‘I know a Fount’, ‘I know Thou art Mine’ and ‘By Love Compelled’ which led into Major George Whittingham’s message on Eternal Love. The Bromley Singing Company represented the local sections. 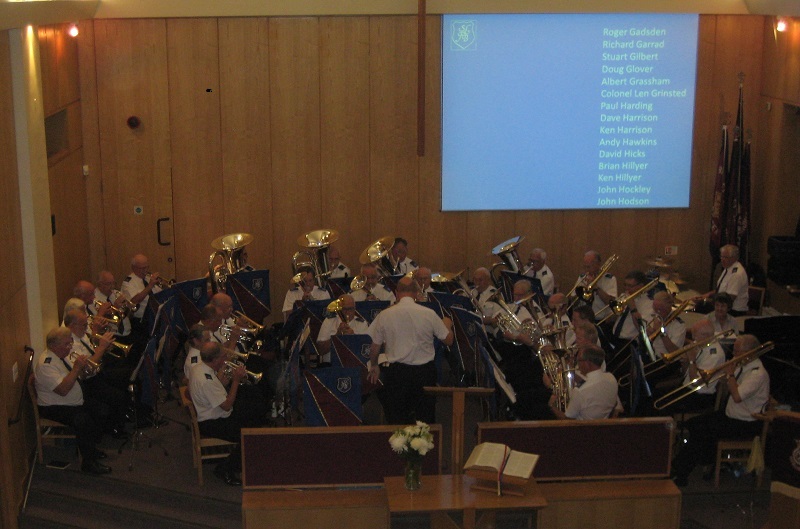 In the afternoon the band once again presented a varied programme led by Darrell Scholes. Their items included ‘The Golden West’, ‘Music Maker’, ‘On the Road’ and ‘Guardian of my Soul’. Further solo items during the afternoon were ‘In this quiet moment’ (Stuart Gilbert, Baritone); ‘He wipes the Tear’ (John Rodgers, Tuba); ‘Harbour Light’ (Adrian Horwood, Euphonium) and the trombone section featured ‘The Cleansing Power’. Phil Edwards (founder and current member of the EEb Bass section) gave his reminiscences of the early days of the band. Bromley Songster Brigade represented the local corps during the afternoon with items which included ‘A Midnight Cry’ and ‘Hush Now’. Stuart Gilbert, on his last official engagement with the band, gave the message from God’s word before the band brought the weekend to its conclusion by playing ‘God be with You’. 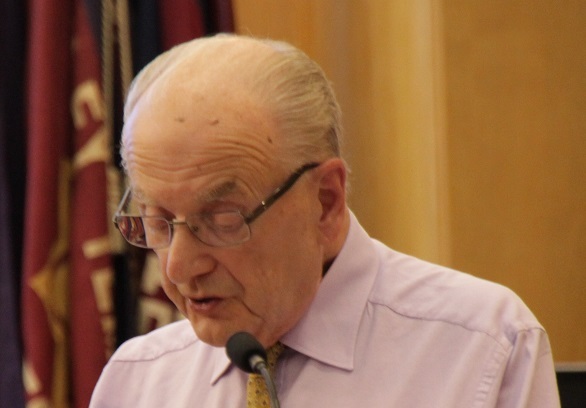 – The way in which the programme of events for this celebration weekend were presented was more than I had expected and I felt all that happened fully emphasised the volume of leadership that had been carried out by Major George Whittingham over those years. – A wonderful musical evening spent with friends. Thank you Gentlemen. – A most enjoyable weekend. 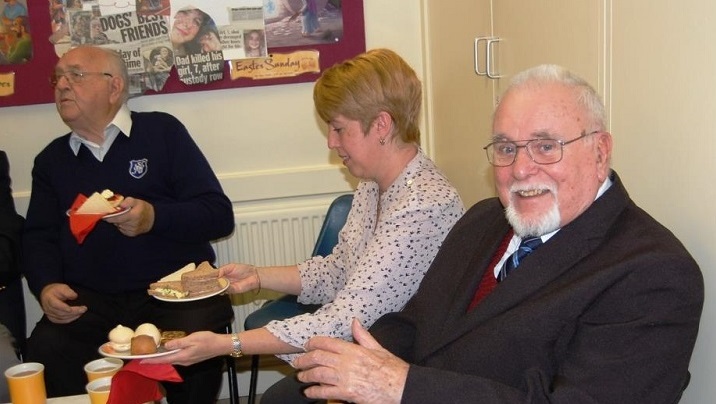 A joy to meet so many friends and chat about the good old days. 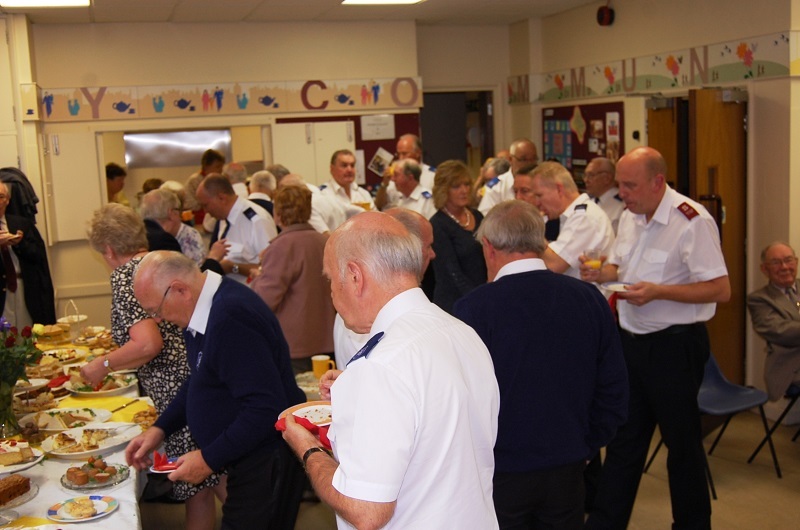 Finally we must express our grateful thanks to Bromley Corps in allowing the weekend activities to be held in their property and to have added to the quality of the weekends gathering. Added to this has been their generosity in allowing the band to regularly use their building for our rehearsals.